Promoting Marianne Lake ticks several boxes. It sidelines another top dog, Doug Braunstein, who failed to spot the London CIO mess; adds another woman to the c-suite; and restores the CFO’s place in the hierarchy. 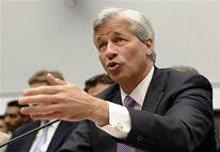 Clawing back some of Dimon’s pay would at last harpoon the whale. JPMorgan Chase has promoted Marianne Lake to the position of chief financial officer. She replaces Doug Braunstein, who will become a vice chairman of the bank and return to his investment banking roots and focus on advising the bank’s top clients. Braunstein has been CFO since June 2010. Lake is currently CFO of JPMorgan’s consumer and community bank. Before taking that role she was global controller of the investment bank between 2007 and 2009 and managed global finance infrastructure and controls in the corporate finance group between 2004 and 2007. Previously she was the senior financial officer in the UK. She started her career as a chartered accountant at PriceWaterhouseCoopers.